The college football season is just really getting rolling and the teams that I follow are pretty much all already out of contention for a National Championship. That doesn't matter, it is still fun to watch the games with friends, share a few frosty adult beverages, and fire up the grill, right? 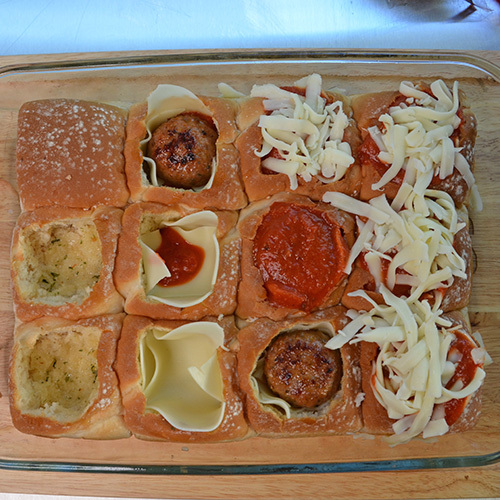 I have just the recipe for you - Open Faced Meatball Sliders. 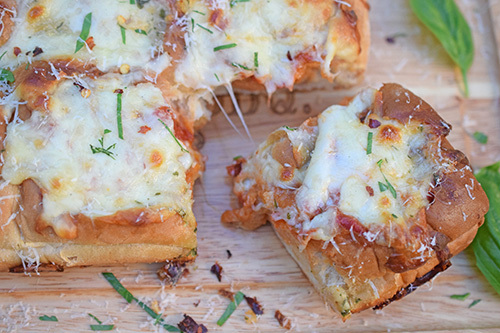 They are cheesy, easy, and over-the-top delicious. Alexis got the idea from So Yummy and this was our spin on it. These are slammin' for any party, office function, or event. 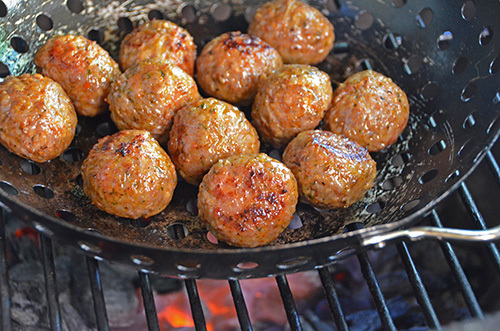 I like to cook them on one of our kamado grills but you can easily do these in an oven. 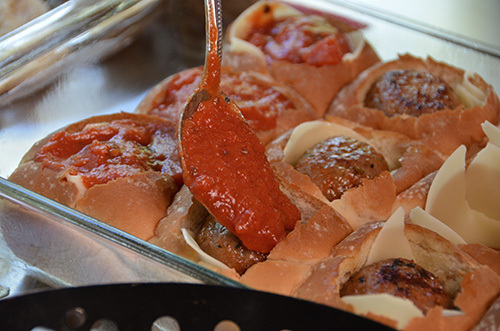 We used store-bought dinner rolls, meatballs, and marinara sauce, that just makes it easy and it seems more like tailgate food that way. But if you get the urge, you could certainly make everything from scratch. Brown the meatballs. First I set up a kamado grill for direct heat running at 400°f and cooked the meatballs in a veggie wok for about 10 minutes. Either stir the meatballs every few minutes or wearing heat gloves, give the wok a good shake or two to move the meatballs all around. You could also do this in a skillet on your stove top. Hollow out the buns. Use a small serated knife to cut around the edges of the roll and then pull the center out, leaving a golfball sized hole. 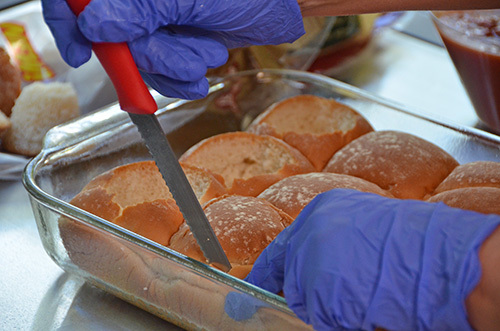 You can save the centers to make bread crumbs, don't just toss them out. Butter the rolls. Put the butter, garlic and dried parsley in a small dish and microwave until the butter melts. 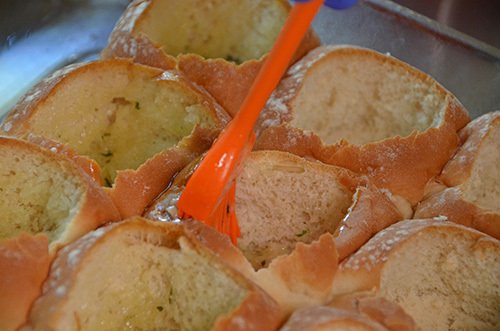 Stir it together and lightly brush the inside of the rolls. Save all of the leftover butter for later. Provolone cheese - it helps to break each slice in half to fit them in. 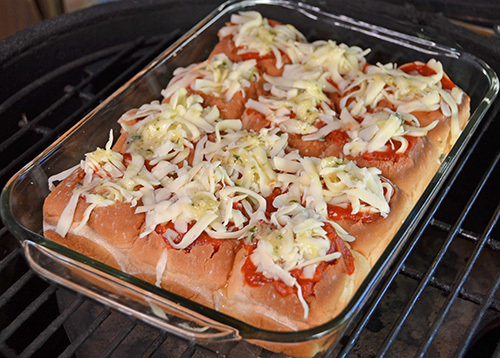 Fill in the the top of the roll with marinara sauce. 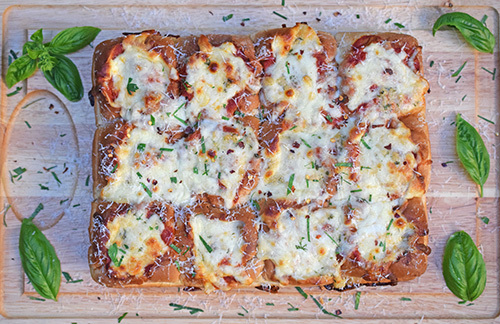 Top each with shredded mozzarella. Pour any remaining butter over the rolls. Now it's time for fire roasting the rolls at 375°f for abour 25-30 minutes, so switch your grill over to indirect heat (or use your oven). For a kamado grill, that means you need to drop in a plate setter (aka Conveggtor) or another heat shield. Shut your air intake vent a little to hold the heat around 375°f. For a charcoal grill, bank your coals to the sides and place the dish over the gap where there are no coals. Lid closed, obviously. For a gas grill, use outer burners to control the heat and place the dish over the burners that aren't lit. Note - This isn't a brisket and you're basically just heating everything through, so don't freak out if your temps are lower or higher than 375°f. Just cook until the cheese is all melted, golden and bubbly. 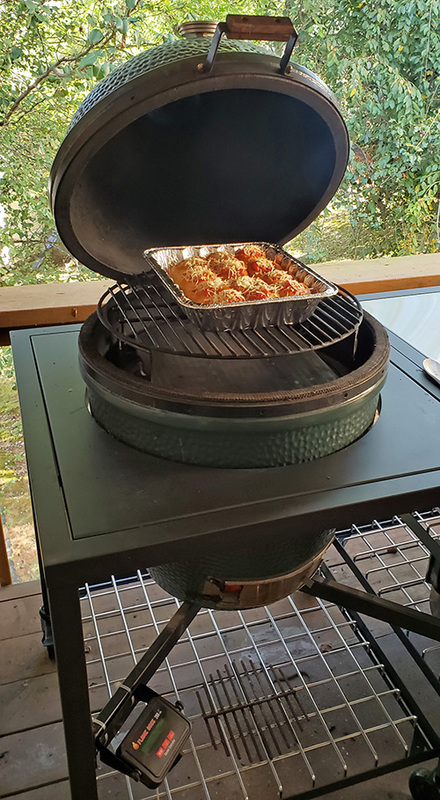 I'm still LOVING my Big Green Egg Modular Nest (full review) that we got from Mannix Pools and Grills in Winter Haven. It is built as tough as a tank, is super easy to clean, and has so much table space. Plus the crossbar is the perfect place for easily mounting a Flame Boss with just a couple of zip ties, no drilling needed. We've used both glass casserole dishes and foil steam pans for this. Both work well. 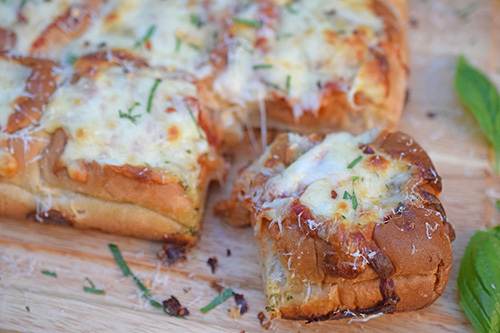 Melty, cheesy, ooey, gooey goodness. When the rolls come out, shred some parmesan cheese over it and sprinkle with red pepper flakes and parsley/basil. 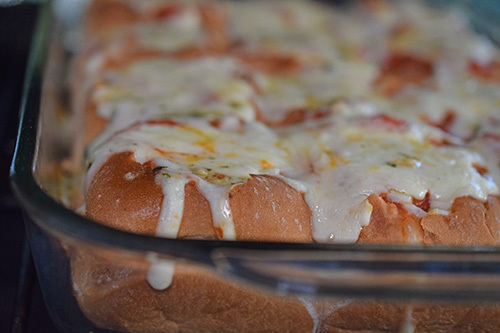 This dish is perfect for game day and always a big hit. You could do the same thing but replace the meatball with leftover smoked pork, brisket, chicken, sausages, you name it.